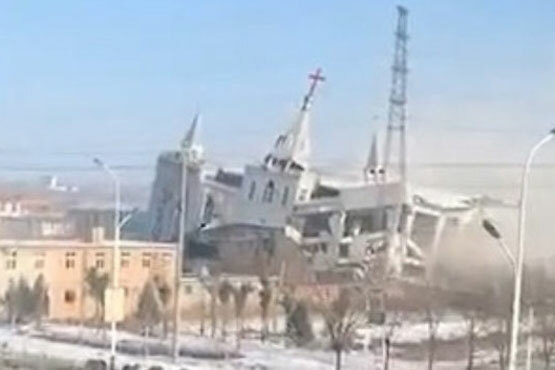 A church in northwest China's Xinjiang region had its crosses, statues, bell towers and other religious features demolished by order of communist authorities. A source told ucanews.com that no reason was given for the action but it is believed to have been carried out because the religious features were "incompatible with sinicization." "It was originally said religious features inside the church should been demolished as well but it was suspended without any reasons given," the source said. The source said he was puzzled by what has happened to the church because of it occurred just before the Chinese People's Political Consultative Conference and the National People's Congress are both held in Beijing on March 3 and 5 respectively and while a Sino-Vatican agreement was supposedly being worked out. "So it appears that crosses should be demolished for sinicization," said the source. "Maybe one day, all the churches will be demolished since they are so modern and beautiful and are against the purpose of sinicization?" he asked. The source said he thinks what occurred to Yining Catholic Churchit may be related to local political tensions in the region. The Chinese authorities have long repressed ethnic minorities, especially the Uyghurs, and religions in Xinjiang, often under the guise of fighting "terrorism." In recent months, tens of thousands of Uyghurs have been forced into reeducation camps and prisons across the region.